A dependable commercial refrigerator is the mainstay of any foodservice business. Your commercial refrigerator is where you will store all your perishable goods and, just like at home, it is the center of attention in any commercial kitchen. In addition, health codes mandate the refrigeration of foods that will not be consumed or sold right away. 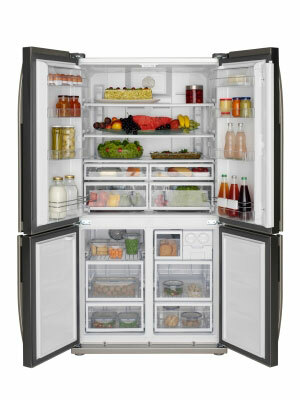 So without a reliable commercial refrigerator for your business, you might as well close up shop and go home. So, what are the important things to look for when purchasing a commercial refrigerator? •	Reach in Refrigerators that are a lot like your residential refrigerator, only larger, stronger, and tougher to withstand constant use. They come with either one, two or three doors. • Pass-Thru Refrigerators are similar to reach-ins but the doors open on either side, allowing it to be placed between the kitchen and server stations. • Roll-in Refrigerators can accommodate various sizes and quantities of sheet pans. They can be found in bakeries and other foodservice businesses that prepare large amounts of food in advance and these sheet pans can be taken from the refrigeration unit directly to the oven for baking or cooking. •	Glass-door Merchandisers used in retail stores, bars, and restaurants in mostly front of the house applications. They are good for take-out areas where you want customers to have a clear view of what is inside for self-service. They are also beneficial for impulse-buying, storing cold beverages and other grab-and-go items. • Undercounter Refrigerators look and work very much like reach-in refrigerators, but they are much shorter and fit in smaller spaces, typically under the counter. They store fewer products and can be perfect for food trucks; as a second refrigerator that stores the most used products; or in smaller kitchens with limited space. • Walk in Coolers allow you to walk in and store large quantities of perishable foods. They can be found in larger commercial kitchens that require lots of cold storage space. They can be set up with shelving systems, or they can hold bulk items and boxed items on the floor. They can be installed in the back of the house, or sometimes outside the restaurant, if inside space is limited. • Bar Refrigeration Bars have their own unique refrigeration requirements, these include back bar coolers, bottle coolers, glass frosters and more that usually fit in the undercounter bar area for easy accessibility. There are several factors that will help you determine the size of the commercial refrigerator you will need to purchase. They are: the amount of commercial kitchen space allotted for this item, the size and type of foodservice business you own, your refrigerated goods delivery schedule and the amount of perishable goods you use in food prep. Commercial refrigeration units come with one, two and three doors, the number of doors will determine the width of the refrigerator. So, exact measurements of your commercial kitchen space, with some inches around for ventilation, would be needed to determine the refrigerator size you could hold. You would then need to determine if that size is adequate for your needs. You would also need to have accurate knowledge of your weekly inventory, your usage and your budget. For example, if you get daily deliveries of perishable goods such as fish for your seafood restaurant that is cooked immediately, then you won't need as much refrigeration as a restaurant that gets weekly deliveries and stores more food prior to usage. Ideally, your commercial refrigerator will be easy for your food service staff to get into and out of, as well as be easy to organize for your particular type of food preparation. Depending on the size of your space and your storage requirements, you may find that you need a walk-in refrigerator, which you could even place in the back of your restaurant. Additionally, casters placed on the bottom of heavy commercial refrigerators can increase their accessibility by making them more mobile. The compressor is the part of the refrigerator that keeps it cold and in commercial refrigerators you can find those with the compressor located either on the top or the bottom of the unit. In a top-mount unit, the compressor and condensing unit are on the top of the appliance, giving you more interior storage space, and keeping the area around the refrigerator cooler. Because these components are on the top of the refrigerator, they have better compressor airflow which results in higher energy efficiency in cool environments. They also allow under-the-unit cleaning and are often chosen for kitchens that tend to have a dusty environment, such as a bakery. A disadvantage of this type of compressor is that the refrigerator cavity will be lower down, meaning more bending and stooping in order to reach refrigerated items by you and your kitchen staff. In a bottom-mount unit, the compressor and condensing unit are located at the bottom of the appliance, therefore the refrigerator cavity is usually smaller than the cavity of a top-mount refrigerator. The storage space in these units is more ergonomically-friendly and more accessible than in top-mount units. Since the compressor rests near the floor, these commercial refrigerators are more efficient for hot environments because the compressor is kept cooler because it is closer to the ground. However,bottom-mount refrigerators are a bad choice for dusty environments, such as a bakery, as the dust and other particles can clog the compressor, requiring constant care and maintenance. A commercial refrigerator uses quite a lot of energy that can easily run up your utility bill. Refrigerators that are built to be energy efficient can save you a lot of money in the long run. Therefore it is a good idea to look for a refrigerator with the Energy Star rating. Energy Star is a governmental agency that rates commercial refrigerators on their energy efficiency. With an Energy Star rating you will be getting a unit that was constructed to reduce energy costs up to 30 percent! While it may be tempting to purchase a used commercial refrigerator, buying a new one offers you the newest and most current in commercial refrigerator technologies, along with all the warranties and service plans you need to keep your refrigerator in perfect working order. As with any used item, you never know what you are getting until you get it home. A used commercial refrigerator, unlike some other types of used commercial restaurant equipment, can have a lot more costly mishaps, the most expensive and likely one being the compressor burning out. Replacing this can easily cost $1000, and that's an easy down payment on a brand new unit. Visit TigerChef and find out how easy it is to finance a new commercial refrigerator for your restaurant.